How about something sugary for those of us who have a little sweet tooth? The MyBlu Liquidpods did not forget to add their famous Vivid Vanilla e liquid to their wide menu of flavors. With its creamy goodness, no one can abstain from trying this sweet MyBlu Liquidpod. Simply sniffing the liquid pods will relax you and remind you of the smell of the small bakery you like going to when you want to treat yourself. Taking a pull, using your MyBlu Vaporizer, will make you forget about your long day and realize you deserved this delicious vanilla custard filled dessert. Inhaling is only the beginning because when you exhale you start to taste more of the flavor that Vivid Vanilla has to offer. It is as if someone handed you a vanilla latte to go with your pastry. The Vivid Vanilla MyBlu Liquidpod will make cheating on your diet a difficult thing to do since this is such a sweet satisfying flavor. Even when you realize that your liquid pod is about to run on empty, you get blessed with a second one. Each flavor from the MyBlu Liquidpod collection comes in pairs, so go ahead and finish the Vivid Vanilla pod so you can continue and start on your other pastry. Each MyBlu Liquidpod is prefilled with 1.5ml of e liquid, which will last you a long time before you start on the second one. This prefilled pod idea prevents messes from being made, so you will have the full vanilla latte and not just half of it. Vivid Vanilla competes with other flavors in the MyBlu Liquidpod collection, but it stands out as being the sweet creamy one that everyone loves to indulge in. Its fresh sweet ingredients will have you coming back for more and wishing you could just spend all day puffing out yummy clouds instead of working. 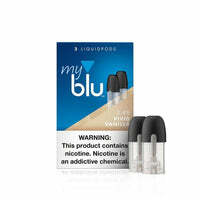 MyBlu Vivid Vanilla Liquidpods (2 Pack)- Blu has a rating of 5.0 stars based on 1 reviews.